Bengal gram, also known as kala chana and black chick pea, is a protein rich and high in fiber legume. Regular consumption of it is said to provide relief from digestive problems like constipation. Its low glycemic index makes it ideal for diabetic people. On top of it, it is gluten free. But don't be carried away by its properties, it tastes wonderful too. 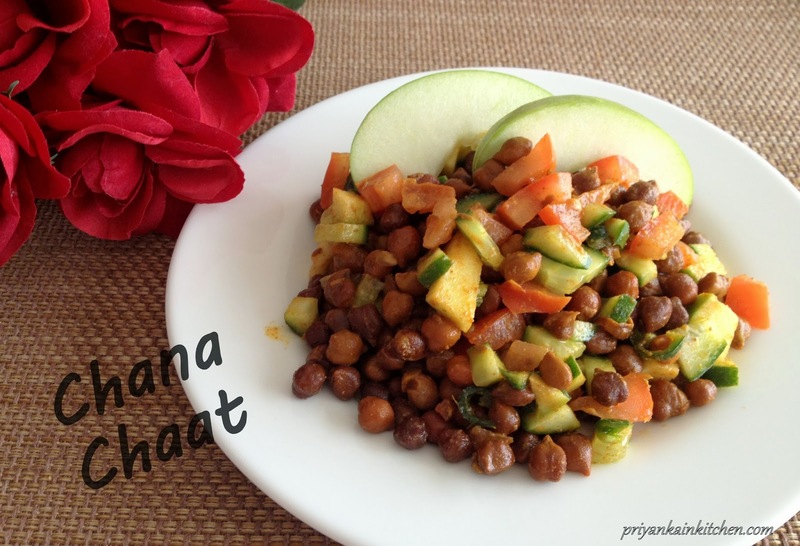 Chana chat is thus a very nutritious breakfast option, though it can also be served as a side dish with any meal. 1 cup kala chana/ Bengal gram soaked overnight or for at least 4-5 hours. Drain water from soaked chana and keep aside. Heat oil in pressure cooker. When hot, add cumin seeds. Let them crackle. Add chana, turmeric, chili and coriander powder. Mix well. Add water and salt. Cook on high until first whistle. After that reduce the heat and cook for another 20-25 mins. When pressure is released, add lemon, cucumber, tomato, green chilies and apple to it. Toss well. Tip: Kala chana takes more time in cooking as compared to other whole legumes. The water to be added depends on many things. Like the size of burner, size of the cooker etc. So, when you open the lid of pressure cooker and if all the water is not consumed by chana, burn the water by putting the cooker on flame without lid.